Suppose a right triangle has legs measuring 9-in and 10-in. 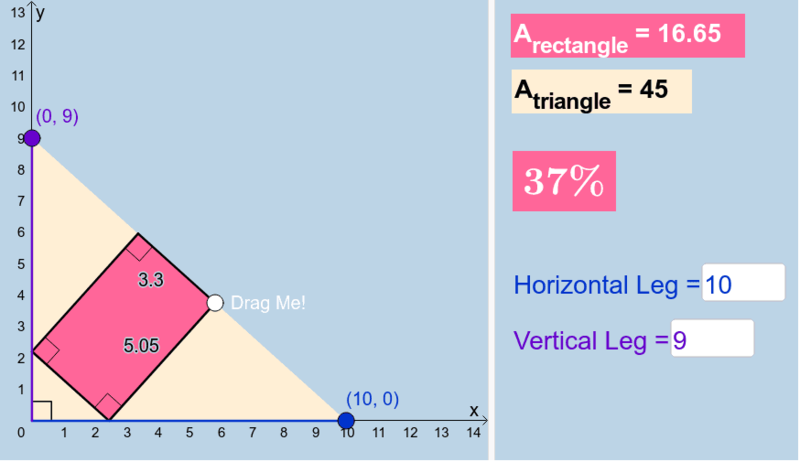 What are the dimensions of the largest possible rectangle that can be drawn inside this right triangle so that one side of the rectangle lies along the right triangle's hypotenuse? What percent of the area of this right triangle would this rectangle with maximum area occupy? Use calculus to determine exact values of the dimensions of such a rectangle. How do your results compare with the data this applet shows? What if a right triangle has leg lengths a and b? What percent of the area of this right triangle would such a rectangle of maximum area occupy? Use calculus to formally prove your conjecture!